Russia and the Arab League say the time has never been better for dialogue to end the two-year civil war between Syrian President Bashar Al-Assad and the armed opposition group fighting to overthrow him. Sergei Lavrov, the Russian foreign minister, and Arab League head Nabil Elaraby both agreed that there were encouraging signs of possible talks between the two warring parties. “There are signs of positive tendencies, signs of tendencies for dialogue both from the side of the government and the opposition,” Lavrov said at a joint press conference. “For now both sides still come up with preconditions but, according to our common view, once there is the key common readiness to start dialogue, then agreeing parameters for this process is just a matter of diplomatic art,” he said. Russia and China have consistently vetoed UN Security Council measures to punish Syria saying supporting and arming the rebel groups would only worsen the violence. Qatar and Saudi Arabia, on the other hand, urged more logistical and materiel support to the Free Syrian Army and the main Syrian National Coalition (SNC) opposition group. The US and the EU recognise the SNC as the sole representative of the Syrian people, while the Arab League has refrained. Russia and China say they welcome talks from both sides. 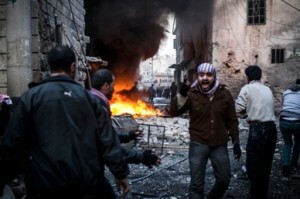 Moaz Al-Khatib, the SNC leader, had several times repeated his offer to meet with officials from Al-Assad’s government. Speaking from Cairo a week ago, Al-Khatib said that he was willing to meet Damascus officials somewhere in rebel-held Syria to discuss Assad’s transition from power. He set a pre-condition that Damascus release thousands of political prisoners. Al-Khatib last week met with Song Aiguo, the Chinese ambassador to Egypt and a few days earlier met with Lavrov, on the sidelines of the 49th Munich Security Conference. Al-Khatib said he had received a “clear invitation” from Lavrov to visit Moscow; Russian officials confirm that this could happen at the beginning of March. “Russia has a certain vision but we welcome negotiations to alleviate the crisis and there are lots of details that need to be discussed,” Al-Khatib said. Al-Assad has not yet responded to any of Al-Khatib’s overtures. The UN says al-Khatib’s offer for talks gives a “glimmer of hope” that the civil war could be resolved peacefully.